Most shoppers have some idea of what they want when they visit a store. While some know exactly what product they want to buy, there are many others that are searching for products that meet certain criteria. These shoppers often use site search to find products that match these criteria — and there’s a lot of nuances behind the psychology of these visitors. It turns out that these visitors are also very profitable. While they only make up a fraction of traffic, they convert anywhere between two and four times as much as other visitors, according to SearchSpring. They also tend to purchase more items and spend more time on site. In this article, we will look at four ways that visitors interact with your site search and how you can optimize your eCommerce store to help them find what they need. When looking for ways to optimize site search, it helps to consider the different types of queries that visitors use. Most visitors have a general idea of what they want but haven’t narrowed down their options to a single product. These might be called broad searches or product type searches. For example, a visitor might search for “laptop” without knowing what brand, size, speed, or other features they desire. It’s your job to show them some options and help them narrow them down to make a purchasing decision. Autocomplete – You should implement autocomplete to help visitors narrow down broad searches right away before moving on to the search results page. 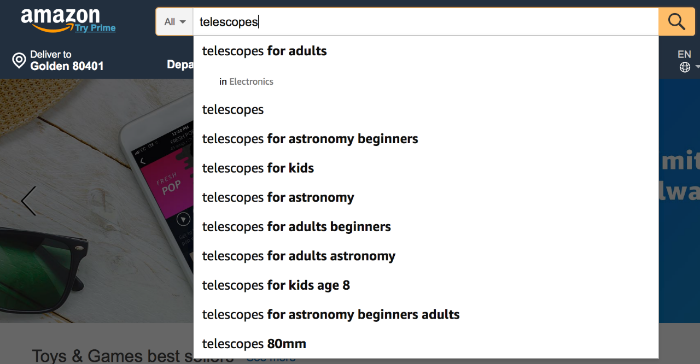 In this example, Amazon.com helps visitors searching for “telescopes” to narrow down the type of telescope that they want without diving into too many details (e.g. kids vs. adults). These search strategies can be implemented using Solr, ElasticSearch, or other search software. For more information on implementation, check out our post on integrating Solr into your eCommerce search. Some visitors take one step further beyond broad searches by requesting specific features. These are often referred to as feature searches or narrowed searches. For example, a visitor might search for “laptop under $500.” They still don’t know the brand, size, speed, or other specific features, but they do know that they don’t want to spend more than $500 on a laptop. Faceted Search – Faceted search breaks down a product type into various features and lets visitors narrow down their search based on these features. This is a must-have feature for modern eCommerce websites. 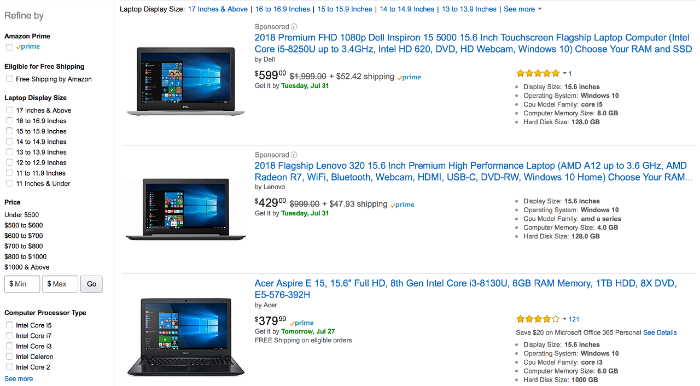 In this example, the visitor searches for “laptop” and Amazon shows a faceted search in the left sidebar to help the visitor narrow down their choices. Show Features – You may want to consider showing the features on the category or search results pages to simplify comparisons rather than requiring the visitor to click through to the product page. Product Comparisons – You should let visitors compare products in the same category by the various features to help make a purchasing decision a lot easier. Many visitors know exactly what they want to purchase and are just comparing prices, availability, return policies, shipping speed, or other product-specific variables. These might be called exact searches or precise searches. For example, a visitor might search for “15-inch MacBook Pro 2018” and expect to see the exact product at the top (or near the top) of the search results page. Autocomplete – Autocomplete is a great way to help visitors narrow down an exact product, and go directly to that page without hitting the search results page. Configuration – Product pages with configuration options—as opposed to separate product pages for each configuration—are a great way to help visitors land on the pages that they want rather than trying to search through multiple pages. 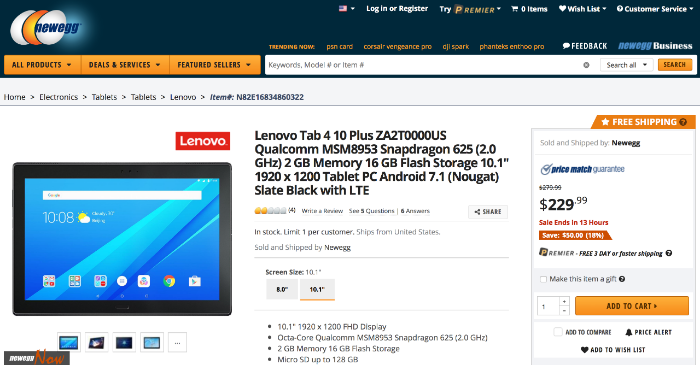 Placeholder Text – Placeholder text, such as the NewEgg search example below, can help visitors understand that they can enter a model or item number to find the exact product they’re seeking. In this example, NewEgg.com shows a price match guarantee, free three-day or faster shipping, and the availability above the fold. The company also shows the “Warranty & Returns” and “Q&A” just below the fold alongside the product specifications and reviews. Some visitors know what they want a product to accomplish, but not necessarily the product — or even type of product — that can accomplish it. These search queries might be called symptom searches or use case searches. For example, a visitor might search for “close up photo lens” and expect to find lenses that take good close up photos — or macro lenses. The goal is to decipher what the visitor is really looking for and help them find the appropriate products. Search Descriptions – Search product descriptions where these phrases might be mentioned more frequently than product titles or other metadata. Provide Guides – Consider providing helpful guides that help visitors learn the difference between various solutions. This is especially useful for narrowly focused eCommerce shops, such as a photography shop. In this example, Walgreens shows products that help address a symptom (e.g. fever) in the autocomplete before taking the user to the product page. They also link to a guide about “Yellow Fever” in case the visitor wants more information on it. When looking for ways to optimize site search, it helps to consider the different types of queries that visitors use. The optimizations mentioned in this article can help you bring your store to par with the most successful eCommerce shops, but if you want to go a step further, you should also look at optimizing search results. Avatria Convert can optimize search result pages by looking at behavioral data from your Google Analytics account. For example, we may find that users searching for a broad term like “laptops” tend to purchase a specific laptop over others. We can modify the order of products on search results pages to show these higher-converting products more frequently. This can help dramatically improve your conversion rates. These same principles apply to category pages, which are similar to search pages in many ways. We can help order products on these pages in a way that increases conversion rates by harnessing your website’s behavioral analytics data. Star your Free Trial today to see the difference Convert can make on your site! 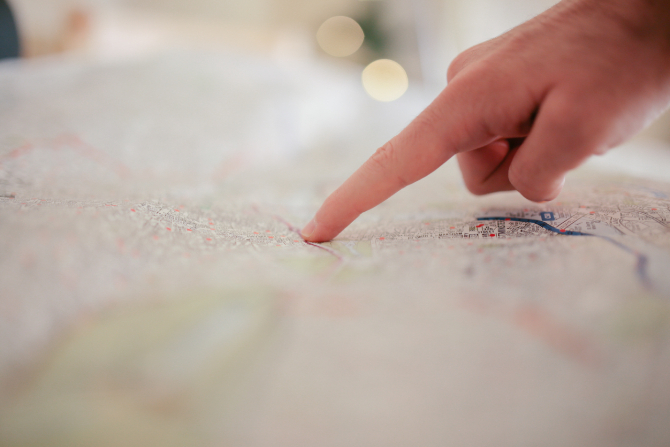 Use this checklist to ensure that your site search is up to par.